Why not take a look at some of the most popular men’s watches on the market, after all most of these watches are highly rated in some of the most important areas, such as function, build, style and price. I had a quick look at some of these popular prospects, there is a descent range of variety, ranging from the new high tech “smart” watches, to some classy old school looks. Most of my picks are ranked with plenty of positive feedback on Amazon, you can click on the photos for more information on each! Technology is taking over, everywhere, and this includes your wrist! The number 1 most popular mens watch for 2016 is a Smartwatch called Pebble. It’s iPhone and Android compatible, comes in 3 color variations; black, red, and white. The Pebble is pretty low key for a Smartwatch, and can easily be mistaken for a digital watch, it has a nice slim profile, with easily accessible buttons on the side. The features are advanced and useful on this model, and include some standout features such as the ability to control your music on your favourite applications like iTunes and Spotify. You will also get your email, SMS and caller ID notifications conveniently straight to your wrist! 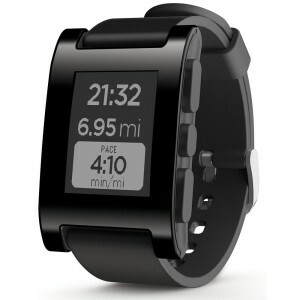 If your serious about a Smartwatch, have a serious look at the Pebble. This number 2 pick is quite unique, for one it can be bought on a very small budget (last time I checked it was on sale at a 73% discount), while also being a reliable and stylish timepiece. The SNK809 has a very streamlined simplistic look, with nice smooth gradual curves on the face and edges. The band is a black canvas, which I personally find quite neat, as its durable and comfortable. 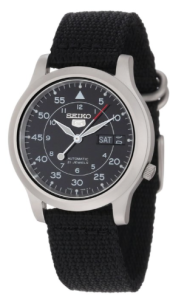 The face and display of the watch maintains a nice sophisticated look which is to be expected on most Seiko watches. 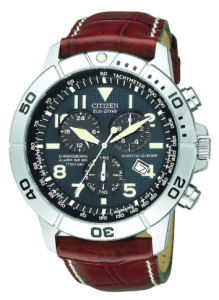 This watch is an extremely popular men’s watch, due to its affordable price point and quality build. Looking for Something a little more sporty? The G-Shock Men’s G100-1BV is a great choice. This model is a very popular choice among active, adventure seeking men. The G100 holds up great to regular wear and tear and will also handle some serious impacts. Water proof up to 200 meters, built with Japanese quartz movement and durable rubber/plastic, the window is also built with a protective mineral crystal that is scratch resistant, there is not much this watch can’t handle. 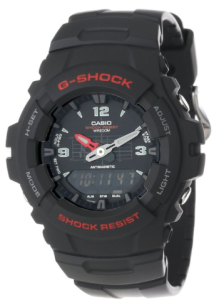 It has a fairly slim profile and is on the smaller side compared to other G-Shock models. At the time of writing this, I was able to find a 50% discount, you can check it out here. 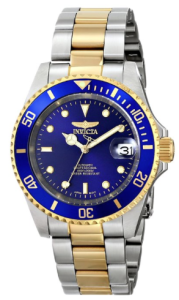 Although I’m not a huge fan of Invicta, this model seems to have really taken off in terms of popularity. The 8928C 2 men’s pro diver is a perfect value pick, offering reliable use and great style on a tight budget. What really shines with this model is it’s ability to mimic the look of authentic luxury watches very well, theres a very good chance people will think your rocking an expensive timepiece when they see you. This Invicta is quite versatile as well, you can wear it to formal events, casually, or even outdoors on an excursion! This one here is a little pricier compared to the above models mentioned, but with that price jump you also get a jump in quality, function, and in my opinion style. This watch is a very popular men’s pick for a reason. It has a very sophisticated look, especially the face. The bezel is also really nice, which is unidirectional and has engraved indicators. The band is also a beautifully tanned Italian leather.